Pastor Faisal John has been serving Pakistani communities since 1998. A decade ago, he met and married Carrie, a missionary from the USA, and together they began a journey of serving Jesus Christ—compelled to spread His love and Word worldwide. Their direct mission in Pakistan usually extends from November through April every year. At Grace Bible Church in Pakistan, Pastor Faisal John shepherds a modest flock of 150 people with well over 400 on Christmas and Resurrection Sunday. Every morning in Pakistan, Pastor Faisal teaches face-to-face, as well as twice on Sundays. Even when in the USA, this little flock receives encouragement and Bible lessons through Skype on the internet. Outreach sends a team of two men to several villages every week to pray with and encourage the Christian families living in remote areas. Grace Academy English Medium School educates 153 extremely poor children as a grace ministry. Their goal is to not only teach them to read and write in two languages, but to reach boys and girls with the Gospel of Christ, and train them to serve Him. Ministries also include our 3:16 Children’s Home for orphans, currently with 22 children in residence and last but not least of all Grace Theological Seminary were 14 men currently studying the deep things of God. When in the USA, Pastor Faisal and Carrie travel as missionaries, teaching and encouraging young people at various youth camps. At churches along the way, they not only share the Gospel, but update members of the Body of Christ on what God is doing in Pakistan. 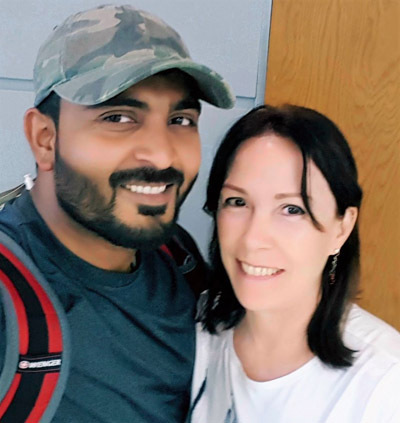 Under the auspices of Grace Bible Church Pakistan, Faisal and Carrie faithfully serve God and depend solely on the generous gifts of our Father’s grace through people like you—His beloved Church. GBCP is incorporated in Arizona and is registered and approved as a 501(c) (3) charity with the IRS, USA. 1TI 4:13 Until I come, give attention to the public reading of Scripture, to exhortation and teaching. We do this by daily Bible teaching in the Urdu language through the internet and is made available online, as well as face and to face at Grace Bible Church Pakistan in Arifwala, Pakistan during mission visits. We also have great joy in the distribution of doctrinal material for adults, youth, and children as an outreach ministry and support orphans and widows, as needed, to build them up in the faith. Our goal is to make the word of God available to Urdu speaking people, to the end that each one might become His and then spiritually become self-sustained, then understanding, walk in the Love of God. Knowing that love is an action word, we are surrendered conduits of this love. Any materials on this website are to be distributed by grace, and are not to be sold. They are made possible by the gifts of believers everywhere in the world who understand that Jesus Christ Himself was the greatest gift of all from God to mankind. 1TI 4:16 Pay close attention to yourself and to your teaching; persevere in these things, for as you do this you will ensure salvation both for yourself and for those who hear you. We are grateful for our brother and fellow soldier in Christ, Gene Cunningham and the ministry given to him at Basic Bible Training Ministries. We especially want to acknowledge our love and gratitude to our Royal Family every where who reveal that "love" is an action word, by thier prayers that uphold us and thier hearts that truly love.